Kooler Guides™ » Unitrack Industries, Inc.
Tests prove the positive heat dissipating ability of the Kooler-Guide. The unique spring fingered configuration firmly pressing the p.c. card against the guide enables the heat to be more effectively reduced. Unitrack’s Kooler-Guide acts as a heat sink to effectively dissipate heat from “Hot” printed circuit cards. Metal fingers press the p.c. card into intimate contact with the guide bar over its entire length. This large contact area transfers the heat rapidly from the p.c. card to the Kooler-Guide and into the chassis or cold frame holding the guide. 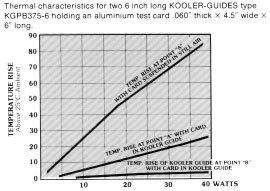 Kooler-Guide is designed for p.c. cards .040″ to .095″ thick. 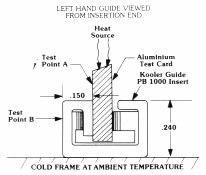 The various mounting methods available make the Kooler-Guide useful for almost any packaging or heat dissipating requirement. Standard spacing of holes, studs or swage nuts. Guides up to 6″ long: 2 holes, 2 studs or 2 swage nuts spaced 1/2″ from each end of the guide. Guides up to 10″ long: 3 holes, 3 studs or 2 swage nuts evenly spaced with the end holes or hardware 1/2″ from each end of the guide. 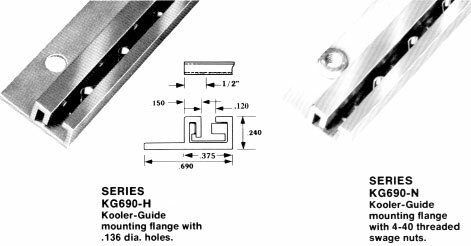 Guides over 10″ long: 4 holes, 4 studs or 4 swage nuts evenly spaced with the end holes or hardware 1/2″ from each end of the guide. Holes not available in Beryllium Copper for series 375. To order right or left hand guides add letter to end of catalog number, L=Left, R=Right. When viewed from the entry end, the heat sink tab signifies right or left. Copyright © 2019 Unitrack. All rights reserved.